First, a probe is constructed. The probe must be large enough to hybridize specifically with its target but not so large as to impede the hybridization process. The probe is tagged directly with fluorophores, with targets for antibodies or with biotin. Tagging can be done in various ways, such as nick translation, or PCR using tagged nucleotides. If the fluorescent signal is weak, amplification of the signal may be necessary in order to exceed the detection threshold of the microscope. Fluorescent signal strength depends on many factors such as probe labeling efficiency, the type of probe, and the type of dye. Fluorescently tagged antibodies or streptavidin are bound to the dye molecule. These secondary components are selected so that they have a strong signal. 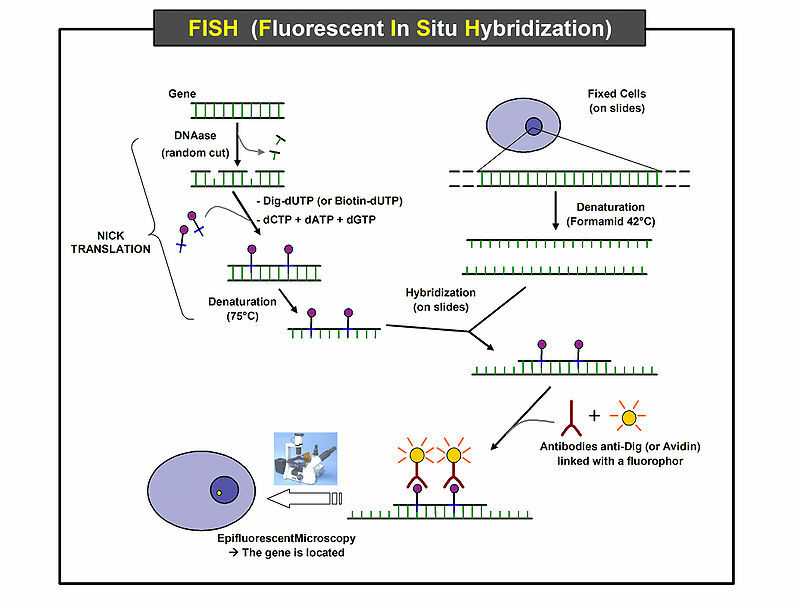 Difference between Southern Blot and Fluorescence in situ hybridization (FISH) ? 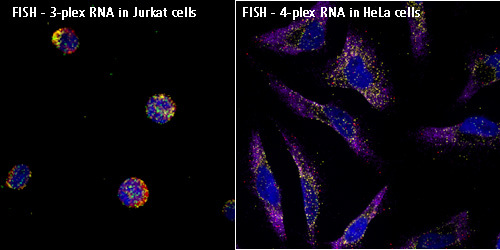 FISH is performed on intact chromosomes through interphase or metaphase.it doesnt need DNA extraction and is performed on microscopic slides. its a type of kariotyping.its use is to determine the chromosomal abberations(numerical and structural) of a patient. But,in Southern blotting you should first extract DNA of the specimen then cleave it with a restriction enzyme and then run on gel electrophoresis. the next step is to blot the DNA on a membrane and hybridaze it with a labeled probe. the use of suthern blot is in detecting mutations and restriction length fragment polymorphysms.